This is the first of three pieces on how to create a deliberate and measurable plan for growing your company. Today, I look at the importance of setting a vision and a mission for the company. Next, I will talk about the yearly planning cycle. Finally, I will set out a series of steps for turning the long-term objectives for your company into a measurable plan for the coming year. When a company is just starting up, its founders are unlikely to spend a lot of time thinking about vision and mission statements or even guiding principles. For one thing, the company founders probably have a clear vision in their heads. Why write it down? Besides, as long as the group is small and working closely together, these things seem to get communicated by osmosis in the hothouse atmosphere of a startup. But something important changes when the number of employees rises beyond a certain point, usually above 40 or 50. Lines of communication lengthen and the people you hire may not be as naturally aligned to your mission. At that point, it becomes important to spend time and effort creating a clear mission and vision statement for the company – one that attracts the right employees by creating a work culture employees can relate to emotionally, and helping them understand why they get up in the morning and come to work. It’s actually harmful for a company to operate without a clearly articulated vision of where it’s going, and why. I didn’t realize this at first, and for a long time I resisted the idea of taking the time to create a clear vision statement for the company. But as the number of employees grew, I watched as people in various departments started to struggle with everyday decisions. Should they invest in one type of customer or go after a different type of customer? What kind of messaging should they use? What features should they build? Employees couldn’t seem to decide. And because they couldn’t decide, they started asking the executives for guidance. But even within the executive team, things got fuzzy. Our decision-making wasn’t as crisp as it should be. Our inability to be decisive about where we wanted to go was slowing us down, creating inefficiency and anxiety. At first we thought we just had a problem with decision-making. For example, if one of our employees in support was working through a ticket, they would know to slow down and take the time to really understand what the customer was trying to accomplish. If someone in user experience was designing a customer journey, they would make sure to envision the ideal future journey, but prioritize and start with the most important features and do them really well. If someone was wondering about whether to invest in a new technology or process, versus refining an existing technology or process, they now knew they should ‘choose the future’ by investing in the new stuff – and not resist change. These guiding principles will help, but not enough. We are really only scratching the surface of what is needed to be effective. In fact, we're realizing that to make the guiding principles truly effective, we need to anchor them in a vision of the company – a vision that includes our values, our mission, and a clear sense of who we are and where we are going. In other words, the guiding principles are just tactics for decision-making; they do nothing to help our employees feel proud of working at Klipfolio – something we felt was necessary if we want good decisions to become second nature. And in retrospect, we realize we should have created these first. Because it helps anchor everything you do in a framework that touches each employee personally, at an emotional level. And that stimulates engagement. People not only know where they are going, they know why they are doing it. 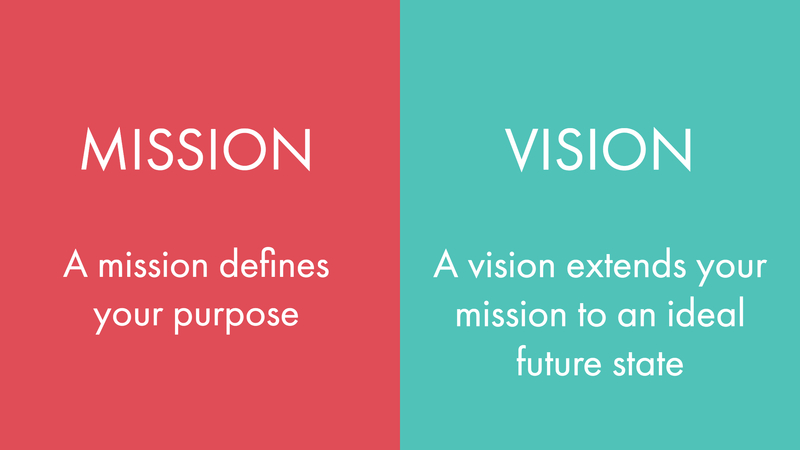 First though, let’s define the idea of a vision statement and a mission statement. We worked with an outside expert who helped us. It was not an easy process; in fact, it’s far more difficult than you can imagine. That’s because in order to truly resonate, your mission and the ideal future have to reach employees at a gut level. They have to reflect something authentic that touches them emotionally, and encapsulate something they are passionate about, something that will truly make the world a better place. People won’t connect with something that is slightly ‘off.’ They have to understand at a very deep level why they get up in the morning and come in to work. They want to feel proud of what they do and be able to articulate how they are making the world a better place. I think if you can’t answer that question it actually harms the company, by limiting how much effort and engagement the employees demonstrate in their daily tasks. We started off a few months ago at a meeting in our office kitchen, and ended up creating an original mission and vision statement based on our answer to the question: Why do we do what we do? The mission and vision – which is still up on the whiteboard in the kitchen – has been massaged and modified at least 10 times. Working with an outside moderator was very useful. It helped working with someone who is not consumed by our business. We also involved our employees in the process; they are an amazing sounding board. We’re proud of the mission and the vision. And it’s a good first step, and actually fits with our guiding principle number four: Think big, start small. And then I watched his reaction. I could see he connected with it - strongly and more positively than people had with earlier iterations of the vision. The opportunity now is to communicate our vision and purpose – to make it crystal clear in everyone’s minds. We’re displaying it on our walls in the kitchen and voicing it in all-hands meetings. As we refine and refresh it, we want to make sure it gets communicated to everyone – employees, potential hires, customers and investors. Already, I am sensing that having clarity of purpose and direction – even the start of one – is making it easier to apply our guiding principles to decision-making. We’ve always said we’re driven, friendly, helpful, knowledgeable and respectful. Our mission and vision statements help us make sure we hire people who share our values, and they help employees understand how to be effective. We plan to put our mission, vision, values and guiding principles into a booklet we can use to educate employees as part of the onboarding process, as well as post on career sites. This can’t happen soon enough. Because I’ve seen what happens when people struggle with ambiguity. And the big lesson for me is that clarity and purpose just don’t happen spontaneously. You have to work at it.